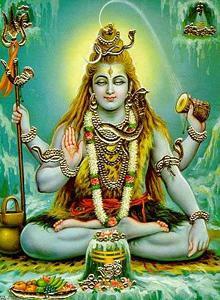 Also what is it that is sitting at the top right of the picture of Shiva in the link below? Last edited by galileo; 22 May 2018 at 10:03 PM. I don't believe that's the sun, but rather Lord Shiva's divine radiance, i.e. "halo". I can't tell from the picture (resolution) what the other item is (top right). Top left is the lingam. like Jainarayan I do not think it’s the sun but Shiva’s divine radiance. May be you just thought where the moon is there must be the sun. Top right could be Amarnath linga. I am not able to upload a picture ... you can google or watch the video. As others have said, this is not the sun. It is halo which signifies divine radiance. You will find it many Deities and holy persons' pictures.